Tired of getting lost in The Villages? 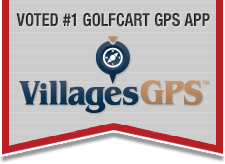 Get the Ultimate golf cart and car GPS APP for The Villages!! Thinking about moving to the Villages? Read this first. What do the current residents think? What do you need to know before you move to The Villages? Your feedback is always welcome on how to improve the website/mobile experience. ONLY specific suggestions should go here and screen shots are helpful. General complaining will be deleted. We are looking for specific constructive feedback on how to make a better experience. NEW members come here first and introduce yourself to us! Please ONLY post new member INTRODUCTIONS here! Specifically The Villages, Florida. Feel free to talk about anything relating to life in the Villages, Florida. Put discussions not directly related to The Villages in the "Non Village" discussion forum. Your Villages news feeds all in one place! Find up to the date news information regarding The Villages and surrounding areas from MULTIPLE news sources all in one place! Updated every 10 minutes! Everything for your Home Improvement needs!! Alphabetical Listings, Diversified Categories, Deals, Directions, 5 Star Ratings and Read/Make Reviews. You can find Home Improvement Contractors in The Villages and see the ratings of their customers all in this section! READ BEFORE POSTING. They build it, fix it, sell it, install it. YOU NEED AT LEAST 10 POSTS TO RECOMMEND A CONTRACTOR OR SERVICE. Any user with less than 10 posts WILL have their recommendation removed. Birthday greetings to anybody and everybody. Villages residents, TOTV members, children, grandchildren. General discussion on the stock market and investments. Anything you read here is from non-professionals and should not be taken as investment advice. Questions and answers about all Landscape and Gardening. YOU NEED AT LEAST 10 POSTS TO RECOMMEND A LANDSCAPER. Weather watchers can share updates here! Everything for Healthcare needs!! Alphabetical Listings, Diversified Categories, Directions, 5 Star Ratings and Read/Make Reviews. You can find Family Doctors, Specialists, Dentists and even Assisted Living facilities that Villagers rate and write reviews all in this section! Implants by Dr. Richard Roach? Computers, Peripherals, Tablets, Cell Phones, etc.